We really should have come to the Balkans before going to Germany. We would have had an extra two weeks here. As it is we missed a lot. There were border formalities! Our passports were stamped, car papers checked and we had to purchase a Green Card. We stopped at the first campsite actually on Kotor Bay. It had the benefit of wifi. So far Montenegro is not that different to Croatia. Now we understand why Kotor Bay is considered a fjord. It becomes much more dramatic as you approach Kotor. 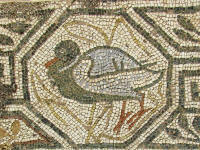 On the way we stopped to look at Roman mosaics. They have mostly been removed and will be replaced sometime. The old town of Kotor is interesting with a castle way up above. There are several squares but the streets in between are narrow without any shops or cafes to make them inviting. Coffee in the St. Tryphon Cathedral Square was lovely because a choir on tour stopped for an impromptu song or two. Back road south we passed through the Mt Lovic National Park. It is a very scenic drive. People live in park and cultivate small fields. There is enough arable land to support a small population. During the Ottoman era the Montenegrins apparently holed up here and because of their fierceness they were left alone. At Cetinje we took the wrong road and instead of going south we went north. Hey its easy to do when the roads twist and turn! As usual it was a marvelous mistake. The narrow paved road wound through a lovely landscape of grey, stony hills with patches of arable land. We ended up on main road between Podgorica and Niksic in the Zeta River valley where we found a secluded parking spot just off highway. The reason for coming this way was to visit Ostrog Monastery which is way up a mountain. It was raining so we took pity on a lady walking up the 7 kilometers from the main road and gave her a lift. Not too pleasant in the back for her but better than walking in the rain and cold. The road twisted and turned as expected. I counted 14 hairpin bends on the way up. Of course there were no safety rails, quite often their were potholes in the tar and one side had sheer drops. 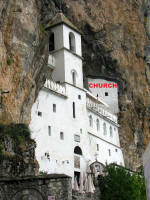 The actual church is very small, basically a small cave with 2 walls to close it in. It is covered in frescoes as were all the older Orthodox churches. The rest consists of covered stairs up the cliff face with narrow rooms against the cliff. It was built in 1665 by Sv Vasilije a bishop from Hercegovina fleeing the Ottomans who objected to Christians. It must have been extremely difficult to build. 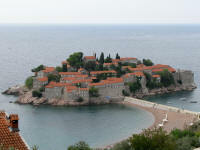 Sveti Stefan, where we camped for the night, was not overly impressive. It is an island joined to the coast by a causeway. It looks picturesque but you have to pay to go on it and for parking. The nearby campground was very expensive for squat toilettes and one cold outdoor shower. At least there was electricity and Pieter finished putting up a light over the door to cook by. A necessity now it gets dark earlier. The road to the border was being worked on. We actually had to wait while they finished rolling the tar! Apart from that not very interesting. The border was easy to negotiate but took a long time because of a car with people and passports that each had to be reviewed. In addition a group of bikers arrived and were served before us because they had a special queue. We drove on expecting a second border post -except there wasn't one. This thoroughly confused us until we realized that the border post was for Albania. There was no exit from Montenegro! Albania is different. There was a beggar at the border, the first obvious one we have seen. Rubbish lies everywhere, buildings are unfinished and scrap yards abound. Unfortunately we didn't see a Land Rover so could not get a step for the back. The traffic is chaotic, rules are there to be broken. And the cars! Most of them are Mercedes, at least 50%. Then there are the BMWs and lesser makes. They must have arrived illegally because the country is poor. Pieter loves the girls. He thinks they are very beautiful. The men aren't half bad looking either. Young men seem to spend all there time drinking coffee and raki. They don't seem to have jobs. Campgrounds are few and far between. We saw 2 signs for different campgrounds and could find neither. Wild camping is easy though. Tirana is being refurbished. The main square is a work site. There are other nice areas though. The washing was put in at a laundry and then we drank coffee and people watched until it was ready. Berat was the next stop. The choice was between the main road and a lesser road. Naturally we took the lesser road. After passing a largish intersection we checked with a service station that we were on the right road. He pointed in the direction we were heading and shook his head (Yes in Albania!). 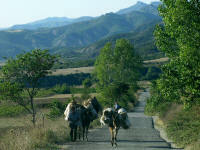 When we arrived in Gramsh it was obvious even to us that we were not on the road to Berat. We had discussed this already. The road to Gramsh goes past a dam and lake. I believed we had passed the dam although there was no lake. Pieter felt we were on the right road. Not that it mattered very much. We decided to continue to Korce and then backtrack to Berat along another secondary road. The road past Gramsh can best be described as a 30kph road as that is the maximum possible speed through the potholes. Once again at Kodo'jut we took the wrong road. It looked the slightly better of the 2 options. It was also heading up hill and we could see the continuation. And we checked with a local who again pointed the way we were headed and shook her head. After an hour we stopped for lunch. A truck we had passed quite some time earlier came by and explained we were actually on a dead end road. We should have taken the worse option! Again we backtracked. The road ran though a canyon at least 20k long. In any other country it would be somewhere at the top of the tourist list. Here it is on a back road. The canyon eventually widened out providing more flatter spaces. The night was spent in a spot overlooking the river. The road deteriorated to a 20kph one until we reached Maliq. Then it improved to a decent tarred road. . Our camping spot was once again along a river. Only this time we managed to get down onto the rocky shore. The river was a reasonable temperature so we both had a good wash. Unfortunately Pieter lost his footing and fell in. He ended up covered in mud and had to rewash. Once again a campfire made the night wonderful. The road continued to be good until we turned off on the side road to Berat along the Vjoce River. Then it deteriorated to a 10-20kph road. This is really a bad road. Once again we were faced with choices as to which road to take. The best is to choose according to the general direction of the road, if it is possible to judge this. And of course the direction you want to go in. When roads wind around hills and mountains it can be a guessing game. Why do we put ourselves through all this? Because the scenery is usually fantastic, much better than on main roads. The people are easier to approach and are usually extremely friendly. I believe we get a much better feel for the country this way. Finally we came to Berat. After being knocked around in the car for 3 days we decided to go into Guest House and have a hot shower to get really cleaned up. The Lorenc Guest House was in the Gorica, an old area where cars can't go and there are lots of steps. It is 400 years old and has been renovated. They provided an evening meal so we didn't have to go out. It was a simple but lovely meal of rice, potatoes, bread, Coca Cola, Veal and a dish with egg, cheese, green peppers and olive oil followed by large sweet grapes. Absolutely Delicious! I spent the morning walking around the Kasa. The walk up to and down from it was unpleasant because of the slippery white cobble stones. It would have been better to get a taxi up. People still live behind the walls. It was a Sunday though and not very lively. It was interesting but not especially awe inspiring. Once again the night was spent near a river in a scenic valley. The small campfire was great. After cleaning the dust out of the car we headed for Macedonia. Later in the morning we had the outside cleaned. Nice to have a clean car for once. Border formalities again, both sides this time. We drove to Ohrid and while eating lunch were approached by a man renting out an apartment with bathroom, kitchen area, cable TV and poor wifi. We decided to take it and relax for a few days. Lake Ohrid claims to be the oldest lake in the world. The town of Ohrid is lovely. The older section has many orthodox churches. The castle (10th century) is impressive at night but in the day light it is just renovated walls. You can walk to all the sights. LP suggests taking a taxi up but the walk is a lot easier than in Berat. St Kliment, a disciple of St. Cyril, established the first Slavic university in Ohrid in 867 where he continued working on the Cyrillic alphabet This helped Christianize Macedonia and spread literacy among the Slavs. Heraclea Lyncestis was founded by Phillip II, Alexander's father. One myth is that Alexander's mother was vacationing here when she gave birth. Therefore he was not born in Thessalonica but in modern Macedonia. This myth has been around for several hundred years so it isn't something thought up recently to enable Macedonia to claim Alexander. The floor mosaics are truly impressive. They depict animals and trees endemic to the area but the shading achieved with slightly different colored stones is amazing. I spent quite some time gazing at the detail. The reason for going to Prilep was to visit the Treskavec Monastery. At first we couldn't find the cemetery where you have to turn right. Eventually, after asking directions we found it, a very large cemetery way out of town. The road is bad. They grade it occasionally but definitely not since the last big rains. The road was very badly eroded in places, in other places we managed over 5 kph! We finally arrived at the gate which was locked. We knocked, checked the advertised times and knocked again. There was at least one monk in residence but no-one came. I can understand if they only want to allow visitors during certain times of the year, but please include that in the notice on opening times. Thoroughly frustrated we set up camp nearby. The view was superb. The country side is hilly and green. I had to ask what was being dried throughout the towns on every available fence and space. It is tobacco! I then recognized tobacco growing in the fields. We stayed in a very expensive, beautifully appointed campground attached to a Best Western Hotel where there was something wrong with each of the 4 available showers! The weather was not so good either, cold with a drizzle. It was still raining but we went into Skopje for a cup of coffee and had a bit of a look around. It seems a lovely city, somewhere we would like to return to. It is really time to head for Morocco though. 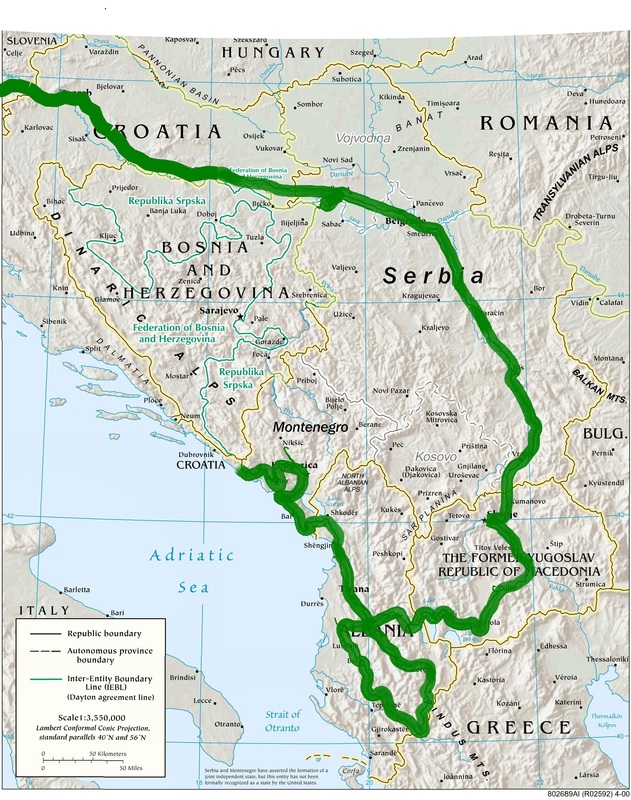 Originally we had intended to go through Kosovo but their border with Serbia is closed. Because of the weather we had to choose between Kosovo and Serbia. We chose Serbia. The border formalities were easy but once again we had to buy a Green Card, this time for a whole month. The weather had us feeling really miserable so we booked into a motel for the night- warm shower, warm dry room and wifi. Looking at the white churches, autumn colors and the rivers through the misty rain was very atmospheric. Everywhere corn was being harvested even in the rain. It is stored in wooden shelters and presumably used as animal feed. Macedonia use the Cyrillic alphabet. Serbia has a mixture of Cyrillic and Roman not only in road signs but in the books on sale. Apparently they learn both alphabets at school and later use either one. Smederevo Fortress is an early 15th century triangular fort built next to the Danube. It is now a large grassed, walled area. At least the apartments for royalty were a reasonable size, unlike castles in the South of France. The entry into Belgrade is not impressive. There are too many square, tall, unadorned, communist era apartment blocks. Finding parking in the city posed the usual problems. We then walked down the pedestrian mall to Kalemegdan. The is a very large fortification started in Celtic times and modified over the centuries by the Austro-Hungarian and Ottoman Empires among others. The area is now basically a large park inside old walls with some archeological works half done. The mall has some outdoor restaurants and should be a lively place in season. I wanted to visit the Ethnographic museum but it is closed on Mondays. On the whole we were not very impressed. We had a lovely night in a campground with hot showers and wifi. We found it by following the boards from the highway. Needless to say we were the only campers. Suddenly it seemed a lot warmer, even though we were at the same altitude and latitude. The only difference was being further west. We welcomed the warmth anyway. The country side didn't change very much except for many old water wells, some of them still in use. One area had lots of blue fire-hydrants as well, maybe because of the amount of wood used in the houses. There were also many small houses, all the same size and shape. Some were made of wood and looked very rustic. Others had been modernized. Zagreb is much more interesting than Belgrade. There are 2 old cities built on hills within shouting distance of each other. Each has a church or cathedral at the top. Kaptol also has cafes along the pedestrian roads and a lively market. Most importantly we found the same grapes as we had been given in Berat, Albania. The Museum of Broken Relationships was very interesting. 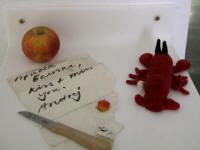 It is a collection of donated items that people consider a memory of the relationship. The story behind the item is included. They range from dresses, locks of hair, shoes made for walking and toys. As usual parking was a problem. We finally found a parking garage with a height restriction of 2.3 meters, tight but enough. Pieter edged slowly through the entrance and we made it! Then we had to go down a level. We didn't quite make it. The fishing hooks on top warned us of the problem. One has been damaged. The solar panel wasn't touched thank heavens. Unfortunately we discovered that night that one of the hydraulic struts holding the roof up had lost it's gas and no longer worked! The fish hooks came in handy for holding the roof up. The third country in 3 days. We could make it 5 in 5 days if we go straight to Italy then Austria. No... its too cold in Austria! The border crossing was again easy and we stopped at a service station for the night. We headed straight for Ljubljana to find a new strut. The toll gate did not dispense tickets and there was no-one there so we went through. Only to be stopped a short time later and fined heavily (10 times the value of the vignette!) for not having a vignette allowing us to drive on the highway. We were furious. So furious that when we got to Ljubljana I wrote a letter to the head of the Traffic Police. We had not seen any signs stating the necessity of having a vignette and did not see a human at the toll gate nor a sign stating you need a vignette. At least now we know. Toyota provides very good service for its customers so a Toyota Dealer was our first port of call. They passed us on to a 4x4 outfitter ( www.mamut4x4.com ). Igor was marvelous. He could not repair or replace the strut but knew where it could be done. He drove Pieter to the right place and within hours we had the new strut fitted. He also gave us detailed instructions on where to go to find a 6 volt battery for our Eberspacher car heater remote. We had dinner with them and camped the night in their yard. After picking up the 6 volt battery for the remote we went sightseeing. As it was cold and wet we didn't do much - had coffee in the square below the castle and drove up for a closer look. Then on to Italy heading south. The first thing we noticed were all the camper vans and another improvement in the weather. We still turned the Eberspacher on from the bed in the mornings though. What luxury. The highways are the best place if you want to move quickly. They are also give a smooth drive. Not for us. Pieter felt there was something wrong with the tyres, he checked them all. After driving for a while longer he stopped again to check. This time he also checked the wheels. One wheel was being held on by only 3 loose studs. The other 2 had been sheered off! Now what! It was Saturday afternoon, not the right time to look for a Toyota Garage. We decided to find a campground until Monday. On Monday we asked a local garage where to find the nearest Toyota Garage. Go back to Savona he replied. Unfortunately there is no Toyota Garage there. We ended up in Genoa and discovered it would take 2 days for the studs to arrive. Wednesday we went in and were fitted in between the cars having services. By lunchtime we had 5 new studs on the wheel and were on our way again. The coast down through Italy and France is quite rugged with many tunnels and bridges. The houses are pale yellow or orange through salmon to pink. Really quite pretty. After a few days resting and doing household chores we headed for Andorra. Here we purchased a new computer for Pieter. He is now the proud owner of an Apple Mac. He spent many days at every opportunity coming to grips with the differences between an Apple and a Windows PC. We spent a few days visiting Doreen and Alec again. Then some days sitting in a campsite with wifi so that Pieter could download the software he needs.